I'm sorry? What? After telling poor people that they are needing to beg for food parcels because they choose poorly in life, John Key justifies his bumbled response to his BMW massage seat, individualized air conditioning, 16 high-performace speaker, DVD players in the back seat luxury t a time of vast cut backs because of the death of a NZ soldier??????? Where the hell does he get off using the death of a soldier in Afghanistan to justify his incompetence? First National said there was no choice but to take up the deal Labour as the previous Government had signed, then National admitted that wasn't true. Then National Ministers claimed they had no knowledge at all of the BMW deal, then they admitted that actually they had sent letters to each other last December discussing it! AND NOW, after two seperate sets of justifications fall on their face as bare faced lies, John Key has the outright audacity to blame his bungled response to this fiasco on the death of a NZ soldier? There are no words to describe the self serving nature of using a dead soldier to justify a bungled PR response to BMW arse massaging seat luxury while lecturing the poor for needing food parcels while slashing welfare for Society's most vulnerable. Private Kirifi Mila's family must be thrilled to know he died to protect John Key's out of touch hypocrisy. 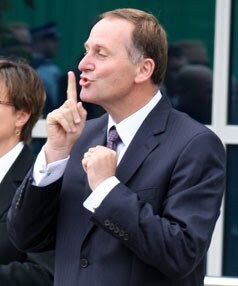 Just look at the photo of John Key, the smirk is repulsive arrogant prick! Key boasts of his glittering financial competence and quick thinking yet claims he didn't read a deal involving the purchase of 34 German cars before signing off on it. How can we trust him then when he signs off on international trade deals with the US or anything? He first told us that he didn't know anything about the deal and blamed his staff, now it turns out that he actually signed off on the deal and had been for a test drive in one last year. It is hypocrisy of the highest order to tell everyone else to tighten their belts then proceed to purchase top of the line European cars in a time of recession. Obviously Key doesn't believe in leading by example.